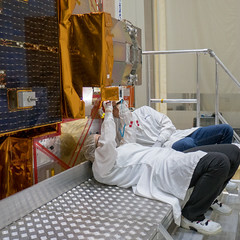 Final health checks on MetOp-B’s Reaction Control System (RCS) have been completed in preparation for fuelling. The RCS consists of tanks that will contain the Hydrazine fuel pressurised with Helium gas, and several small thrusters that can be used to adjust the satellite’s orbit after separation from the launcher. The specialist team from Astrium Ltd, who prepare the RCS for launch, arrived in Baikonur in mid-April and quickly began to test the RCS to make sure everything was working correctly following shipment. Tests include functional checks of the valves and pressure transducers, a calibration of the pressure sensors and tests to ensure there are no leaks and that the satellite is safe before activities begin to load the propellant. A Helium-tuned mass spectrometer is used to detect and measure any leakages. In parallel, the team also prepared the equipment for propellant loading. 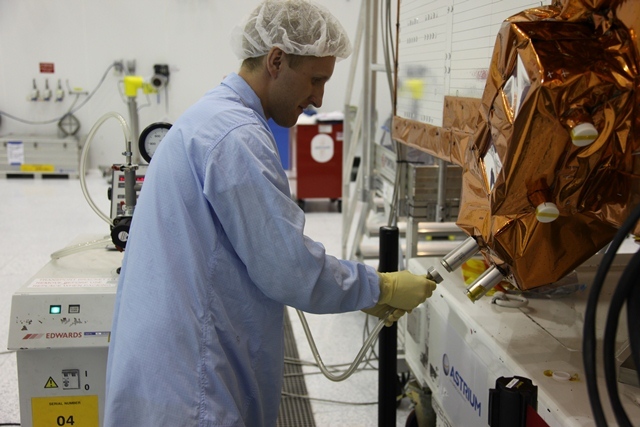 Hydrazine is a hazardous and highly flammable chemical so has to be handled very carefully to ensure the safety of the team and the satellite. There are also health risks if in contact with skin or inhaled. For this reason, the team have to wear what is known as a SCAPE suit. This stands for Self Contained Atmospheric Protection Ensemble and is basically a protective suit with an air supply that allows the wearer to work safely. 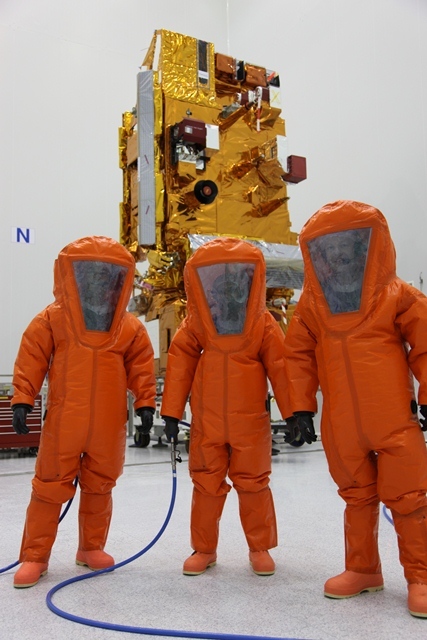 The operators are specially trained in working with Hydrazine whilst wearing these suits. The RCS tests have all been completed and everything is ready to begin the loading of the propellant, making MetOp-B ready for launch.